The story of St. Lucy comes to life in colorful, full-page illustrations and lively text for children ages 4 through 9. St. Lucy, holy and pure, loved Jesus very much. Christians remembered her story and told how she died for her belief in Jesus. Lucy liked to help people who were lonely or sad. She took food to the hungry and gave money to the poor. Often she would meet with other Christians to pray and talk about Jesus. The Church honors St. Lucy as a martyr, a hero of the faith. 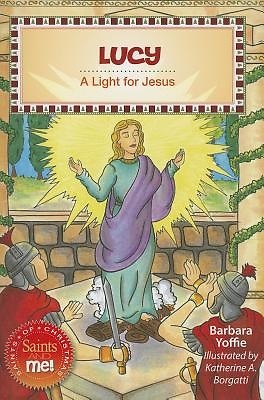 Author and long-time elementary educator Barbara Yoffie helps readers develop an understanding of saints as real-life heroes and heroines who live all around and inspire us to become more like Christ. St. Lucy is one of 6 saints in the Saints of Christmas set, part of the Saints and Me series.